ST Gill’s caricature ‘Native Dignity’ is a highly loaded image which may be deciphered on a number of levels. As the title suggests, there is dignity in the challenge presented by this Aboriginal couple as they proudly promenade past a sign advertising ‘Fashion’ in their incongruously jaunty array of tatted European garments. Through their simple act of defiance, white pretensions are satirised and the Aboriginal sense of fun is celebrated. Originally painted in Sydney in about 1860, the watercolour was later printed as a black and white lithograph in Melbourne in 1866. 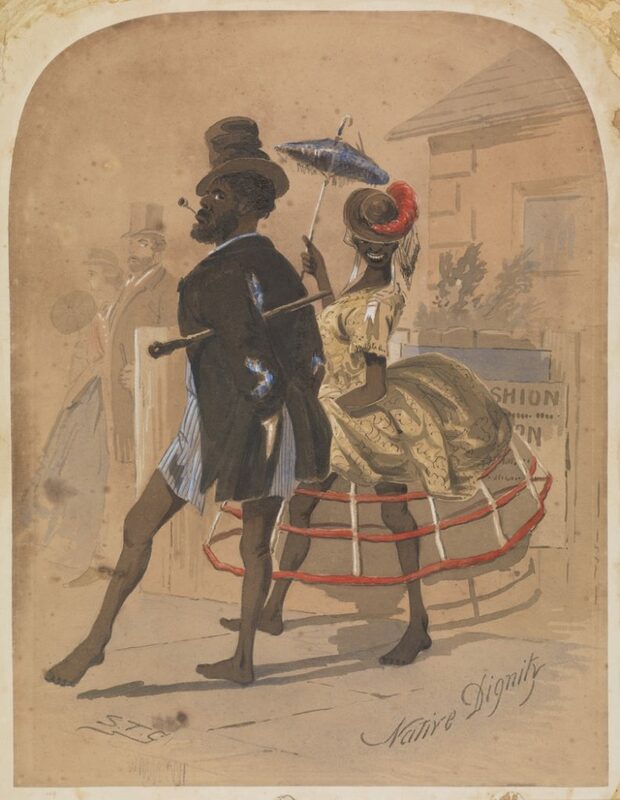 At first glance, this image might be viewed as a humorous comment on the incorrect appropriation of European cast-off garments by an indigenous man and woman in a direct affront to the two ‘respectably-dressed’ colonial onlookers causing the female pedestrian to deliberately avert her gaze. Alternately, it can be seen that Gill has posed a visual query: who is mocking whom? Many Aborigines who accepted European clothing were reluctant to adopt garments that masked their gender and scarification. As recorded in this image, Indigenous men, in particular, frequently chose to wear only a shirt or a jacket, seeming to dislike trousers, perhaps because they impeded movement and tribal attire included no leg covering. Often jauntily accessorised with a hat and/or swagger stick (a type of short cane), it was the uncovered legs of Aborigines that offended European sensibilities most. The Indigenous woman portrayed in this image wears that most ubiquitous of mid-century 19th century fashion accessories, the ‘cage crinoline’. Invented in the mid-1850s, this light-weight steel support allowed European women to dispense with layers of heavy petticoats, freeing their limbs for walking. Being cheap and easy to manufacture, it was one of the first fashions to be almost universally adopted though, if not managed properly, it could also be a source of embarrassment – bobbing up and down unless short steps were taken and swinging wildly on windy days – which inspired more jokes than any other women’s fashion accessory up to the time. Lack of interest in and experience with European clothing and dress codes often led to their misuse by Aborigines. For white Australians, who saw dress and observance of its codes as a sign of civilisation, clothing misuse confirmed the primitiveness of the first Australians. On settling into Sydney Cove, both British and Indigenous people would have expected to trade as a gesture of friendship on first contact. Traditionally, Aboriginal people wore little clothing though perpetuation of bartering practices did encouraged Aborigines to dress in the settler’s cast offs. Comments about what ‘pleased’ or was ‘demanded’ by Aborigines record the types of European clothing goods that were ‘valued’ with hats, in particular, considered ‘exotic’ and rare. Watercolourist and lithographer Samuel Thomas Gill (1818-1880), better known as S.T. Gill, lived in Sydney for period of 8 years, from 1856 to 1862, recording the patterns of social activity in the city and its surrounding suburbs. This image is one of a series of brilliant characterisations of urban life that Gill may have started while resident in Sydney but which were completed after his return to Melbourne. While Gill left no written statements on his social and political views, the visual evidence provided is overwhelming and, behind the comical facade of his ‘Colonial Comicalities’, there lies a serious social critique. In commenting on his subjects’ affectations, Gill’s art held up a mirror attacking the social structures developing in colonial Australian urban society for more than four decades. S.T. Gill sailed with his family for Adelaide, South Australia, at the age of 21, arriving in December 1839, where he quickly set up a studio in Gawler Place, advertising that he could supply ‘correct likenesses’ of people, horses, dogs, local scenery and residences. Far and away the most popular artist of his era, as a visual reporter Gill seems never to have rejected any minor detail. An accomplished horseman, Gill travelled alone on horseback throughout the settled areas of South Australia, before moving to the Mt Alexander (Castlemaine) goldfields in Victoria in 1852. The excitement and squalor of goldfields’ life proved an inspiration to Gill. A skilled lithographer, well able to make his own plates, Gill soon returned to Melbourne with a large collection of watercolours and wash drawings, publishing his first series of prints to great success in August 1852. Gill regularly returned to the diggings, making sketches wherever he went. At the height of his fame as ‘the artist of the goldfields’, Gill travelled to Sydney in 1856 hoping to repeat his Victorian success. Unfortunately, due to a slump in wool prices, Sydney was suffering an economic depression. Gill was forced to supplement his income by working for the illustrated newspapers; by this time he was also beginning to suffer the effects of his alcoholism. He quickly produced a set of lithographs, Scenery in and around Sydney (1856), and received several further commissions. Returning to Melbourne in 1862, Gill worked consistently during his sober periods, making a large number of lithographs from his ‘Colonial Comicalities’ cartoons, including ‘Native Dignity’, a series he hoped to release in a publication which did not materialise. Gill continued to produce drawings for the Melbourne Herald until his death. By 1872, his health was failing as the venereal disease he had contracted on the goldfields was aggravated by his drinking. On 27 October 1880, ST Gill died destitute, on the steps of the Melbourne Post Office, and was buried in a pauper’s grave in the Melbourne General Cemetery.